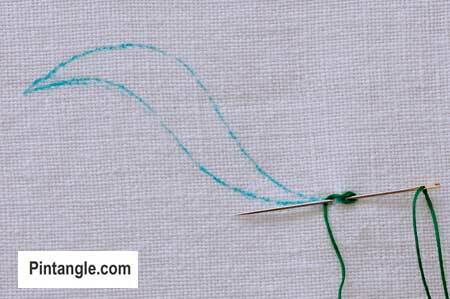 Raised Satin stitch is also known as outlined Satin stitch. 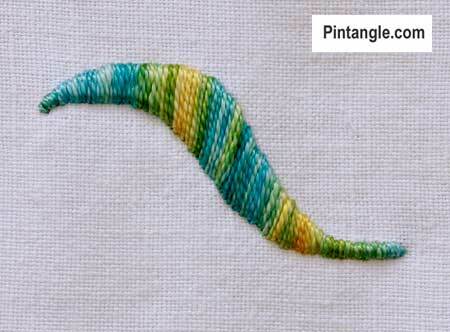 You can see why when you look at how this stitch is constructed. If you have trouble creating an even edge when you work a shape in satin stitch then using Outlined or Raised Satin will solve your problem. Raised Satin stitch is simple to work as it is created by working straight stitches close together over an outline of chain stitches. 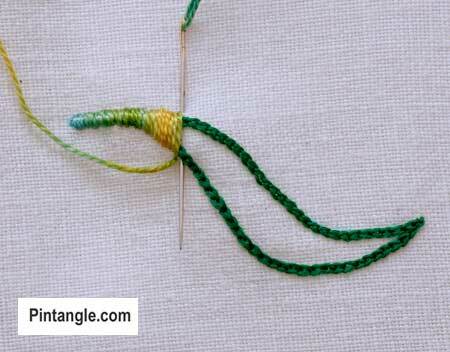 So, in order to work Raised Satin stitch you need to know chain stitch and satin stitch. Once mastered you will always be able to work neat uniform edged filling stitch. Mark your shape on fabric using a one of the air erasable pens that are available on the market. 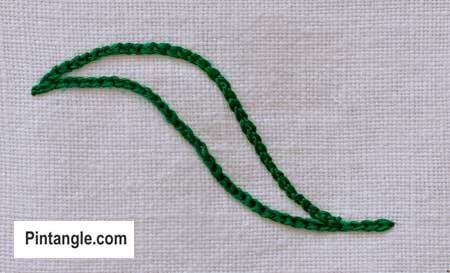 Work the outline of your shape in chain stitch along the line you want to raise. The next step is to work Satin stitch over the outline. 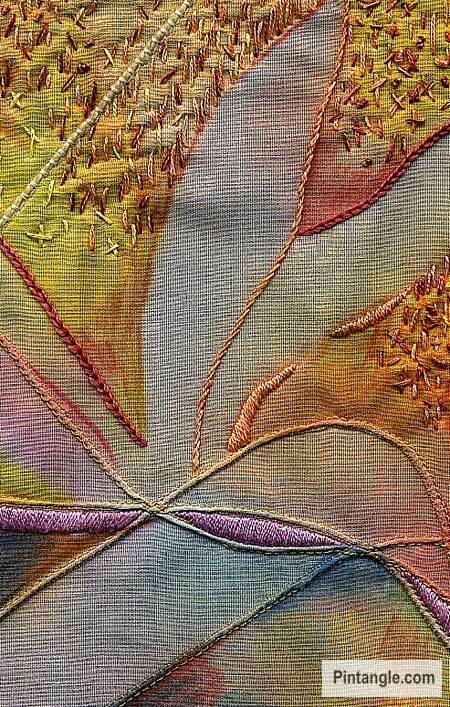 The Chain stitch lifts the satin stitch just enough to define the shape clearly. To work the stitch bring the thread up through the fabric and work straight satin stitches very close together but not on top of each other. 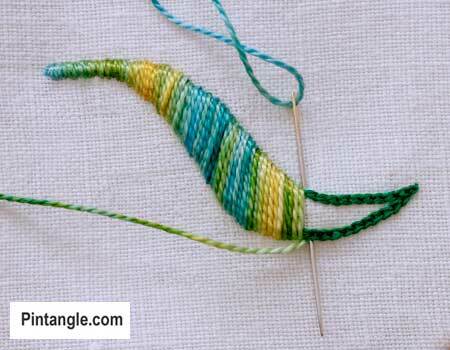 Continue working straight stitches side by side until you fill the shape. If the stitches too slack that they sag or too tight that they pucker the fabric use an embroiderers hoop. I will certainly try this version as my satin stitching is not always good. Reading stem versus chain makes me wonder if the chain would support the edge better, giving a fuller look. I’ll have to experiment to see. My book of stitches is growing thicker. Thanks for sharing. So.. That’s how it’s done. When I was at school, we were taught to cover the area with tiny running stitches going in random directions n then covering with satin stitch.. No outline stitch at all!! Mind you nothing against my sewing teacher- I loved her.. but it’s been years since I’ve done satin stitch..
Julia that is Padded satin stitch and it is coming up and I do it a quicker way but the principal is the same ie to pad the underlayer with stitches. This outlined version is my most used however. Thanks for sharing your techniques! It is always fun to see your work and how you do things. A teacher with whom I had a class several years ago used the split stitch to outline a shape for the raised satin stitch. I’ll try your way with the chain stitch and see which works better for me. Thanks! Sharon, thanks again for a great tutorial, such a beautiful section of your work. You’re the best! Thanks Sharon, once again for this stitch. Sending my love from our holiday country (home of DH) Croatia. I have tried to do raised satin stitch by outlining in stem stitch. 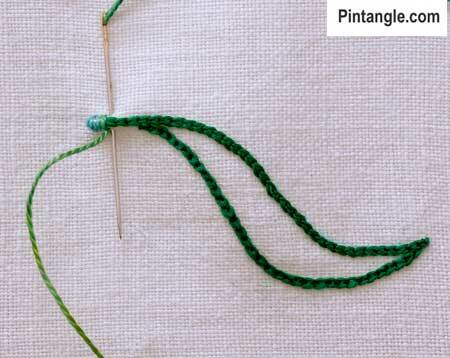 It has raised the shape but do you think chain stitch is better or it doesn’t really matter? I usually have a problem with an uneven ‘up’ (coming up from the back) side of the satin stitch even though I use outline stitch around the edge. Will try using chain…maybe more support will help? Love your tips!!! I’ve never “loved” my satin stitch. Thank you for the tip, anxious to try now!!??? ?